Back in 2006 wireless internet, known as wi-fi, moves from public places like coffeehouses and city dwellings to campgrounds and outdoor parks. In our commercial society, technology rules our city lives with televisions, cell phones, email & internet everywhere. 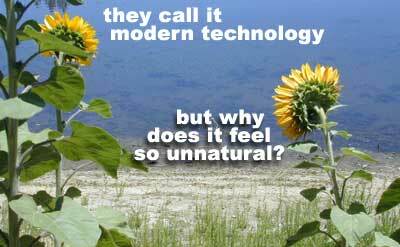 Must we stay connected so much, that we bring the internet with us to Mother Nature? We pacify ourselves with each new idea & desire. Is this instant gratification harming us, or helping? learn to unplug, tune out, get away from the city and escape into nature - for an entire weekend! What used to be accomplished by a personal phone call & conversation is now done by an short email with some digital images attached. In the wilderness inconvenience is usually the way of daily life. Problems arise and you solve each one, if possible. After a full day, you can start to slow down, enjoying the day & appreciate the lessons given by roughing it. Forcing the boundaries of what belongs in nature & what doesn't is a recent topic of debate: nuclear radiation, genetically modified organisms, pesticides and surveillance drones, just to name a few. New cell phone (or microwave) towers have been sprouting up in our National Forests for decades. Now the Wi-Fi in campgrounds is quite common. 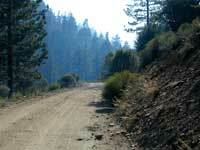 Campgrounds are considered public places and plenty are located in cities or busy coastlines. But who ultimately decides about all these invisible energy waves bouncing around? Does all this wireless technology seem overkill to you? Are we slowly baking our brains for communication and convenience sake? Will we pay a price with health conditions for our willingness later on? In this fast paced world, we American consumers are the guinea-pigs for the high tech lifestyles. Long term studies of wireless gadgets are still far & few in between. With the popularity of cell phones & GPS's in recent years, the search & rescue of a stranded hiker or a snowmobiler is a much easier task. A modern convenience can become a life saving tool. Internet connectivity on the other hand is a luxury for most, especially outdoors. 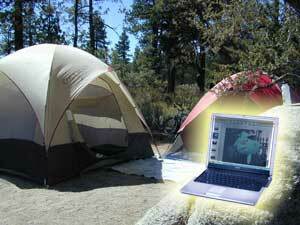 Wi-Fi internet service will be found at the largest, most popular campgrounds in the coming years. The places that cater primarily to RVs. Here at Total Escape we consider these luxury campgrounds. (flush toilets, showers & laundry facility kinda digs). But the new service will also be found at smaller State Park camps too. Although steep terrain & dense forest will make it nearly impossible to transmit the signals very far, todays technology's encroachment is here. Where will we draw the line? Nature heals & inspires us in a way that is unexplainable. We should value the earth in it's most natural form & of course, respect it by not overdeveloping. Yes, many folks would like to have wireless connections, but is this in the better interest for ALL: humans, wildlife, our precious life giving vegetation, the natural earth. While I have watched my share of DVD movies on the laptop under the stars, that is not disturbing anyone else (except maybe the squirrels, who were sneaking off with the pretzles) and as usual, Total Escape Adventures primarily camps outside of developed sites. As the state of California gets more & more crowded, these kinda topics will be popping up more often. Bookmark this site, so you can find the total seclusion you seek. As motorhome sales continue to rise & retiring baby boomers take to the open road, technology will play a major part in their nomadic lifestyles. While physical fitness & recreation plays a huge part of the camping experience, it seems odd that computers are now a part of standard travel equipment. From backpackers with GPS units to full time RVers keeping in touch with family, technology on the back roads is here to stay. California's parks have not implemented this technology (yet), but big 'ole Texas will become the first place to provide wireless Internet service at state parks. Removing yourself from the daily grind of the city to relax & get centered again with breathtaking scenery gives an opportunity to stop, slow down & reflect; Retreating to the wilderness for peace and solitude is a very common weekend activity in California. From our hectic lives, the urban sprawl, commercial centers & congested freeways, we wanna escape more & more often. Encounter one too many inconsiderate idiots, the tension builds, tempers flare & we know we hafta go away. Anywhere... just go. Getting outside is enough, but breaking the county limits is sometimes the key factor.